Osteoporosis affects 1 in 2 women and 1 in 4 men and is the leading cause of fractures in adults over the age of 50. Dr. Keven Tagdiri provides comprehensive bone density testing and osteoporosis treatment for adults of all ages. Based in Encinitas, California, since 1991, Dr. Tagdiri is a dedicated internist and primary care doctor with experience and compassion. Call Keven Tagdiri, MD, or schedule an appointment online today for effective osteoporosis care. Osteoporosis is a bone disease that occurs when your body loses too much bone or doesn’t make enough bone. Normally, your body breaks down old bone to replace it with new, strong bone — however, osteoporosis disrupts this natural process. With osteoporosis, too much bone is broken down, not enough new bone is built, or you have bone loss and no new bone growth. This makes your bones weaker and predisposes your bones to break — possibly even with small movements — like stepping off a curb or sneezing. If you’re 50 or older and have broken a bone, ask Dr. Tagdiri about getting tested for osteoporosis. Osteoporosis affects both men and women and is more likely to develop in people over the age of 50. It’s also a silent condition because you may not know you have it until you break a bone. If you’re concerned you may have osteoporosis, Dr. Tagdiri performs bone density testing. He begins with a risk assessment to understand your overall health, medical history, and any medications you’re taking. If you’re at an elevated risk for osteoporosis, Dr. Tagdiri performs a dual-energy X-ray absorptiometry (DEXA) scan. 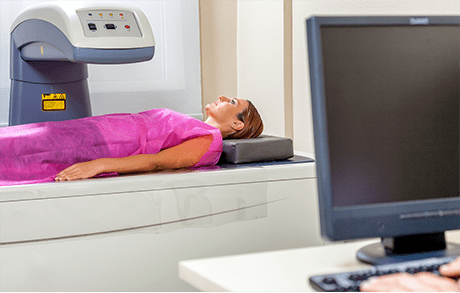 A DEXA scan is a quick and easy procedure in which two low-energy X-rays are emitted and pass through your arm to produce a digital picture of the inside of your bones. Using specialized software, Dr. Tagdiri then reviews your DEXA scan to determine how much bone loss you’ve experienced and the best course of treatment based on your condition. Depending on the severity of your osteoporosis diagnosis, Dr. Tagdiri recommends appropriate treatment measures for you. If you have a mild amount of bone loss, Dr. Tagdiri advises you on lifestyle and nutrition changes you can make to improve the health of your bones. If your osteoporosis is moderate or severe, Dr. Tagdiri prescribes medication to support healthy bones. Medications for osteoporosis come in pill, liquid, and injectable forms so you can choose the best approach for your needs. Learn about the health of your bones from Keven Tagdiri, MD, by calling or scheduling an appointment online now.